100th Blog Post and Free Gifts Giveaway, at My Old Historic House. First, I would like to thank, all the new friends, I have made out in Blogland. I love you all and look forward to getting your comments every time I post. This has been an amazing journey for me. When I moved from the big city,St.Louis, to the country, little did I know what a big life change, I was making. The little town I live in, has a 490 population. There is no gas station or grocery store. I actually grew up here, but was away from some 40 years. I was not totally prepared for country life. There is not a whole lot to do here, one has to travel to find entertainment.Most people here are married or in a relationship, making it hard to have a good friend. I had a very hard time with this and I was often depressed. Some one suggested that I do a blog, and the rest is history. I am so excited that in 8 short months, I have over 180 followers and this is my 100th post. For a year or so, I followed a couple of bloggers that both have antique shops. Soon I would go and check out the people that left them comments and then those people, and before you know it, I was really into following blogs. While I was restoring, My Old Historic House, I always thought it would have been fun to do a blog about it and the process. One thing I did to help pass the time was selling things , on ETSY, a on-line store. When I was in the process of leaning how to do that, I learned a photo processing called PICASA. I thought if I can do ETSY, I am sure I could do a BLOG. After all, how different could it be. Thus my Blog: www.myoldhistorichouse.blogspot.com - was born in December of 2010. My only regret is that I hadn't done it much sooner. I use a $150.00 point and shoot camera from Walmart. It is COOLPIX 7X, Quick Response.None of that means a thing to me, I just copied it right off the camera. I have had no training in the use of my camera, I did read a few pages of the instruction book.When I bought the camera, I asked the sales person to give me the easiest camera to operate they had. This one has a rechargeable battery, just plug a cord into it, don't even have to take the batter out. I do clean up my pictures using Picasa. It is easy and free,Just download it onto your computer. It is wonderful. You can brighten up, darken,crop , straighten and various other things, all using this simple process.I usually spend about an hour taking pictures for each blog post. I have learned a lot from just doing. It takes much longer to clean up the photos and down load them into a folder. I also have learned that, GOOGLE CHROME, works much better than plain GOOGLE. Just download it, again it only takes a few minutes and is also free.I do a lot of research for most of my post, as I wanted to put a little more something-something into my Blog, than just pictures. I get a lot of comments about this part of my post.I am glad you all like it! Getting and reading comments is the best thing about doing a blog. Several bloggers have stated, that they blog for comments .I am right there with them.The first comment I got was from a close friend. But, it sure was exciting to get it. I soon learned to get comments you need to give them. A lot of my first followers were gained by me, going to other blogs and asking the owners to stop by mine. I looked for blogs about antiques, decorating and the American South.. Some of these bloggers have stayed with me, while others have gone on there way. Some of them, I consider to be a good friend. We email, call on the phone, send funnies and just keep in touch.Linking to other blogs has been fun and is a good way to get followers and find new readers.It is fun to be part of a group and soon there followers become yours and so on. This whole Blog thing is amazing. Who would dream that people in Europe would see my blog. One day I got a long distance phone call from New Zealand. It was from Christopher Moore, the wallpaper designer. He had visited my blog and saw where I used 2 of his Toile designs and wants to come and photograph my two rooms for a book he is doing. Some Bloggers and I hit it off right away. I spent New Years Eve -emailing back and forth with a fellow Blogger, and I told her, it was the best date, I have had for New Years Eve, in a long time. I find myself waiting for my favorite Bloggers to comment on my new post and if they don't ,I always worry ,way not?I have a friend, Blossom, we are both addicted to Blogging. We get on the phone for hours and comment to each other, about this blog or that one. If she finds a good one, she tells me and if I find one ,I tell her.I know I spend way to much time Blogging, but it has given me a whole to life. 100th BLOGGER POST GIVE AWAY! As I mentioned before, this post is my 100th post. So, I wanted to make it extra special and give back a little to all my friends and followers. I am doing a GIVE AWAY. I have three prizes that I have picked from my gift and antique shop, Richard's Great Stuff. I have chosen fun things that I think you all might like. 1.) A French Tin Calender, A magnet is used to mark the day and month, so it never goes out of date. It can be hung or sat. It has a fun floral design and the months are written in French. 2.) A Satin, lace and feather bed room pillow. Made around 1920-1940. Has Marabou feathers, laces and tiny floral trim. 3.) A Gift Registry Book for your home or business. Has a very Southern design with pictures of Camealias and pretty gold leaf letting. The rules are pretty simple. To have a chance to win, you must be or become a follower on my Blog. The three prizes will be given to three different people, so you have three chances to win. Just send me a comment and describe the prize you would like to win and give me a good reason why you would like that prize.The better the comment, the better your chances, to win. You can make as many comments as you like, and make them for each prize. My Friend, Blossom and I will read each comment and the two of us will pick the three winners. We will pick the winner on Friday, August 12th and I will do a new post on Saturday ,August 13th, to announce the winners. I know it might hurt your chances in winning, if more people enter, but, I would appreciate any, "Shout Outs" ,about this contest. Don't be shy, get on that computer and comment. I am so excited to get them and read them all. A tin French Calender from Victorian Trading Company. 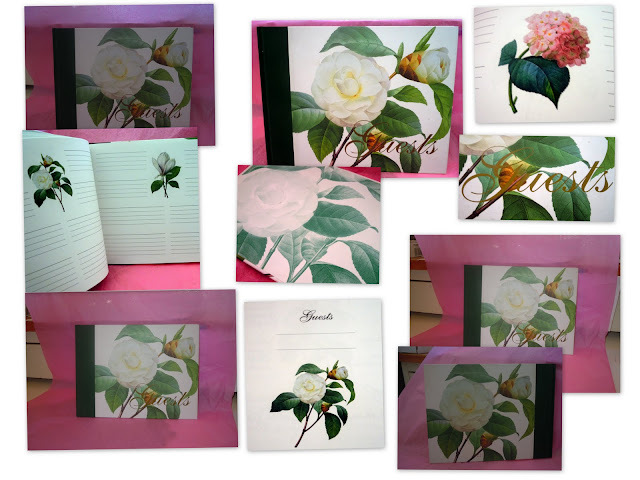 Southern Inspired Guest Registry Book for Home or Business. Thanks for coming along today for a visit at, My Old Historic House. I hope you have had fun and you will enter my contest. And if you are ever in my neck of the woods, I hope you will come by for a real tour. I will leave the lights on and Sissy Dog will always meet you with a jump and a kiss. GOOD LUCK! MAY THE BEST BLOGGERS COMMENTS WIN! Cheer me up with lots and lots of Comments on my Daddy's Blog!